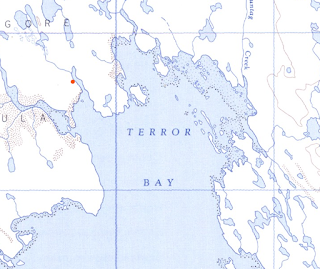 To further confuse the issue, my notes for Dr. Stenton's presentation "Death on a Distant Shore" at the Royal Ontario Museum say that in conversation afterward: "Stenton says they were told the story that there was something where the water deepens in Terror Bay, went by helicopter & searched but saw nothing Last year. Also searched all around Terror Bay for the big camp site (hospital) but didn't see anything." They saw several cairns. I had assumed that "Last year" meant the summer of 2015. When the discovery was initially announced, I had assumed that all parties were working in close cooperation. As events unfolded and hiding behind "protocols" became apparent, it bothered me that professionals of Park Canada were not even in the loop for several days. Not exactly a ringing endorsement for professionalism from the ARF. I do hope procedural issues are a thing of the past and if so, it will allow the story to unfold as it should. How many chances will we get to "discover"? We can't afford to mess anything up as these archaeological sites are too important for mere enthusiasm to become doctrine.